Image above: False color infrared image of floating leaved plants on Lake Warner, MA. The canoe is surrounded by white water lily, and the smaller leaved plant (left) is water chestnut, an introduced invasive. This image was made from a pair of synchronous (RGB and NIR) photos taken by a rig lofted by a helium balloon. The balloon aerial photography over Lake Warner, MA included 2.6 hours of continuous shooting (every 12 seconds) by the original near-infrared-camera from the balloon mapping Kickstarter in January 2012. This is the longest continuous sequence those two Canon A495s have delivered. We captured 796 pairs of regular and infrared vertical photos of the lake and surrounding area. Some of the RGB photos have been stitched into an orthophoto. I used Ned’s Fiji plugin to combine the RGB and NIR channels from the photo pairs into false color infrared (NRG) images and NDVI. 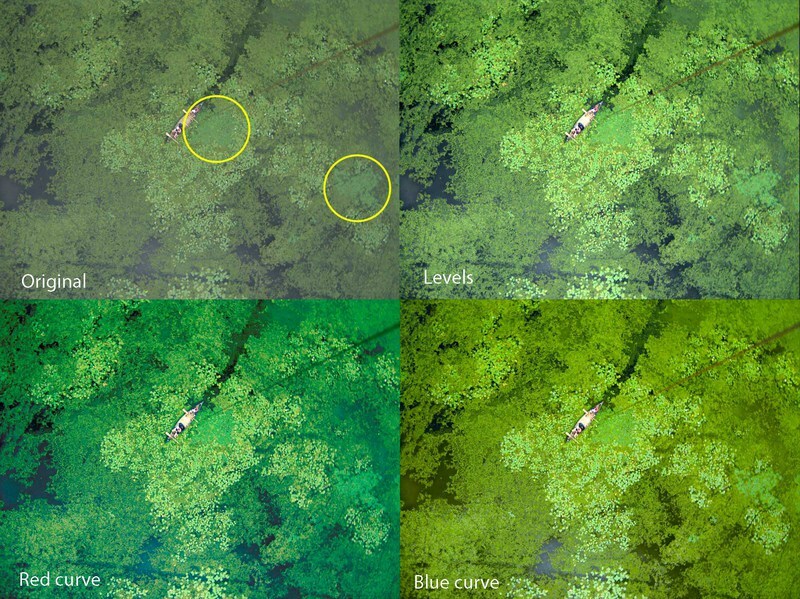 A goal of this project is to try to distinguish water chestnut (Trapa natans) from other floating plants, so the NDVI images will probably not be very helpful. But I hoped that by replacing the blue channel with near infrared data, the NRG images could enhance the difference between water chestnut and other plants. A regular visible light photo from the unmodified camera in the near-infrared-camera rig (upper left). There are two patches of water chestnut in the scene (circles). Using the “levels” tool in Photoshop allows the maximum dynamic range which separates the colors a bit (upper right). Using the “curves” tool allows individual color channels to be adjusted. Adjusting the red (lower left) and blue (lower right) channels changes the relationship among colors but does not make the water chestnut much more distinct. I tried adjusting the regular color photo, but there was only a slight improvement in water chestnut distinctiveness. The NIR photos display everything as grayscale, because only NIR light reaches the sensor and each of the channels captures pretty much the same band of NIR light. A standard way to combine visible and NIR light in one image is to display NIR data as red, display red data as green, and display green data as blue (blue data is not used). 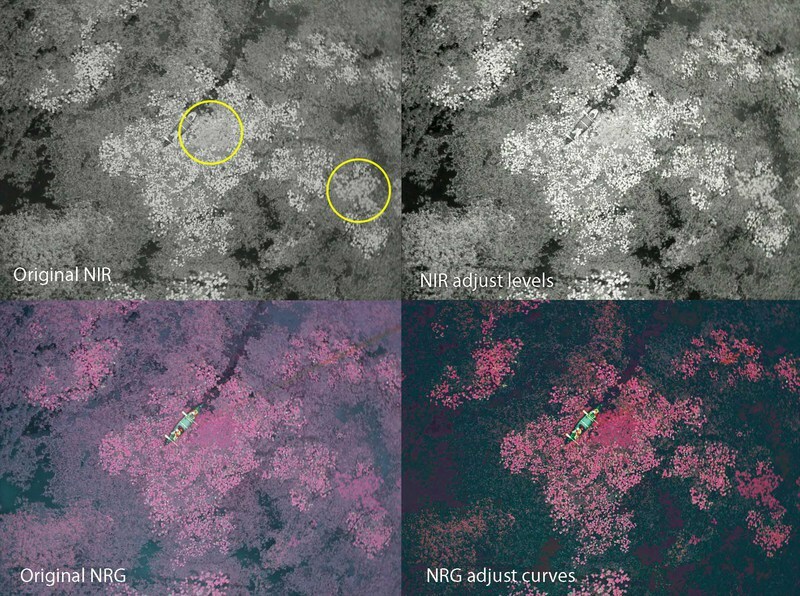 These NRG images highlight where vegetation is (plants are reddish and most other things are not) and sometimes help to distinguish different plants. The NRG images allow water chestnut to be distinguished about as well as good RGB photos, especially if the RGB photos have been enhanced a bit. A photo from the near infrared camera (upper left) with two patches of water chestnut (circles). Increasing dynamic range makes water chestnut marginally more distinct (upper right). Water chestnut appears darker purple than white water lily in NRG images (lower left) and might stand out a bit more if the color balance is adjusted (lower right). One thing I should try is to adjust the levels on the RGB and NIR photos before making the NRG images. That will maximize the dynamic range of the photos and maybe separate the colors more in the NRG images. There are probably other tricks I could try.